to both clients and patients. 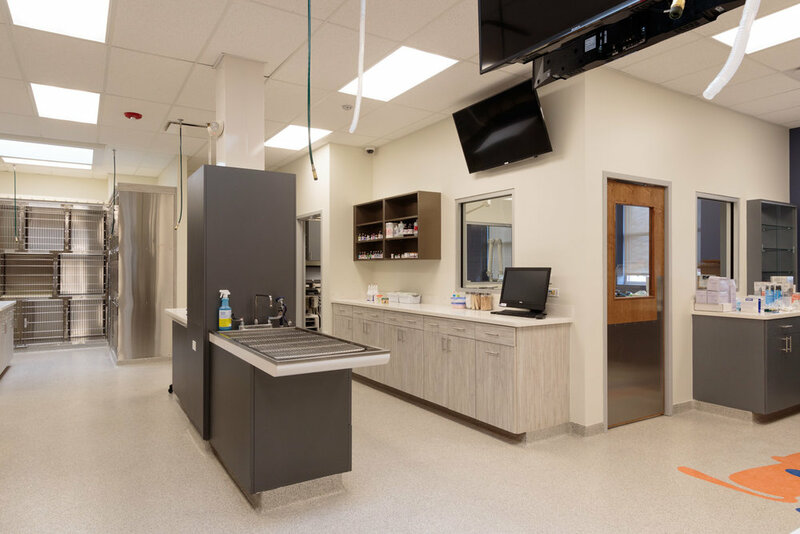 Along with basic veterinary care, the facility provides surgical suites, a physical therapy room, pet grooming, dog day care, dog training, pet adoptions, and dog and cat boarding. 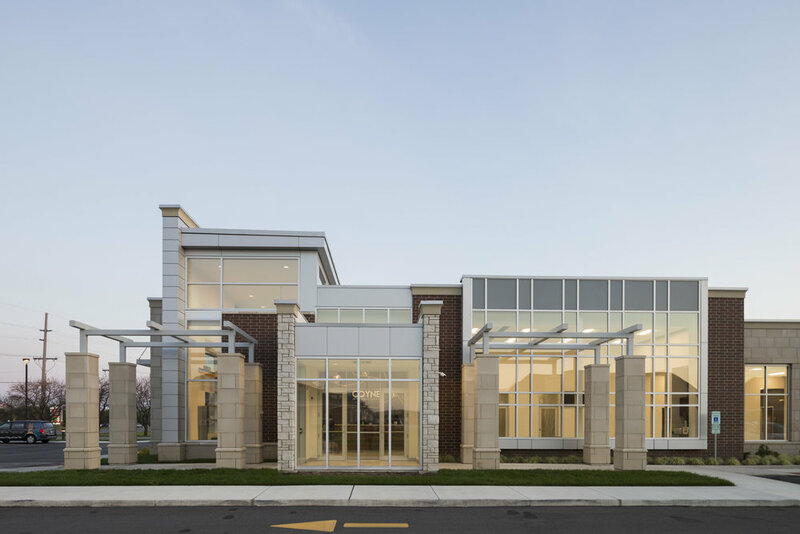 The modern exterior of the facility invites guests into the bright, spacious lobby. Once inside the lobby, a 30 foot-long reception desk allows staff to expeditiously service their clients. 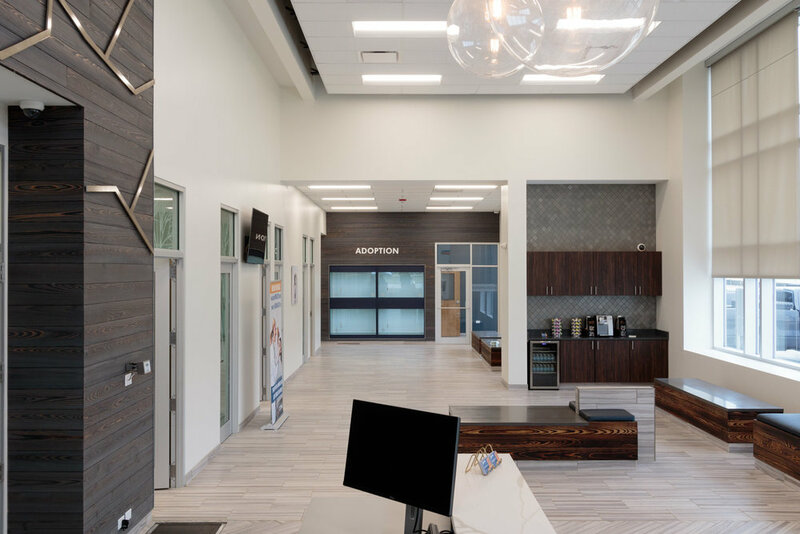 The check-in desk and backdrop are clad in reclaimed lumber with a decorative floating soffit above that provides a warm, natural feeling to the lobby. Other lobby features include a refreshment center, adoption display and viewing room, retail shelving, and public restrooms. Windows in the lobby extend to the floor, and clerestory glass above the check-in counter provides natural light and views to outside. Eleven exam rooms flank the “L” shaped lobby, providing direct doctor and tech access from a wide controlled hallway, which also functions as pharmaceutical work space. 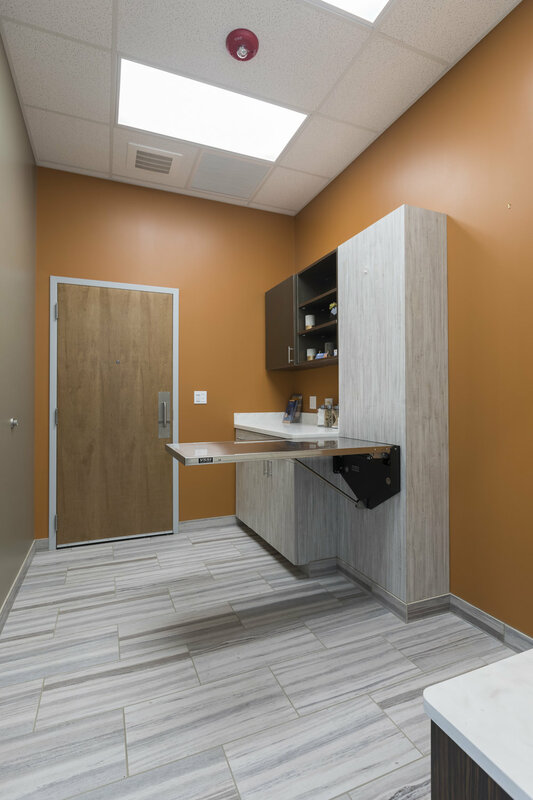 The treatment and lab areas are located immediately behind this space, allowing direct access from the exam rooms to the treatment area. 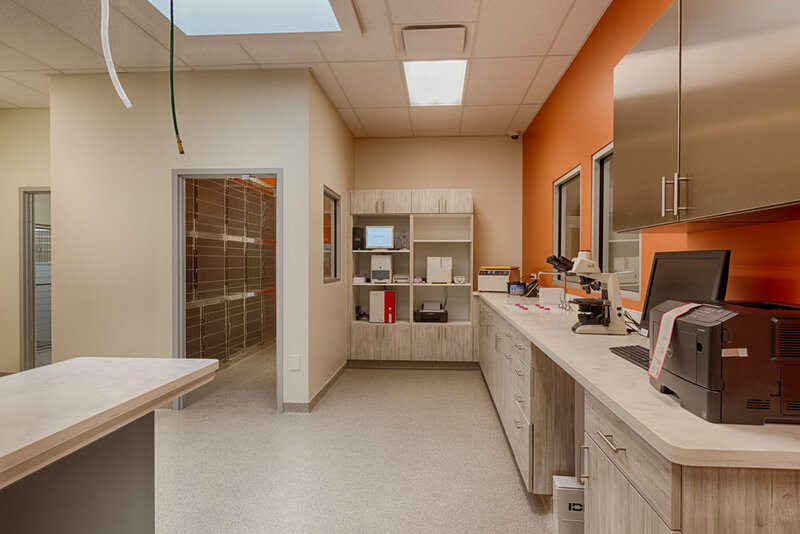 The treatment area includes two surgical suites, dental suite, x-ray, dog ward, puppy ward, and cat ward. Pet boarding, grooming, and dog daycare areas can be accessed from the main lobby or from a secondary entrance that is located off of the parking lot. These areas include boarding for 106 dogs, cat boarding, outdoor courtyard play area, two indoor open play areas, outdoor play area with pool, grooming area with six grooming stations and a wash / dry room, and laundry. The boarding areas include clerestory windows and skylights to maximize natural light into these spaces. 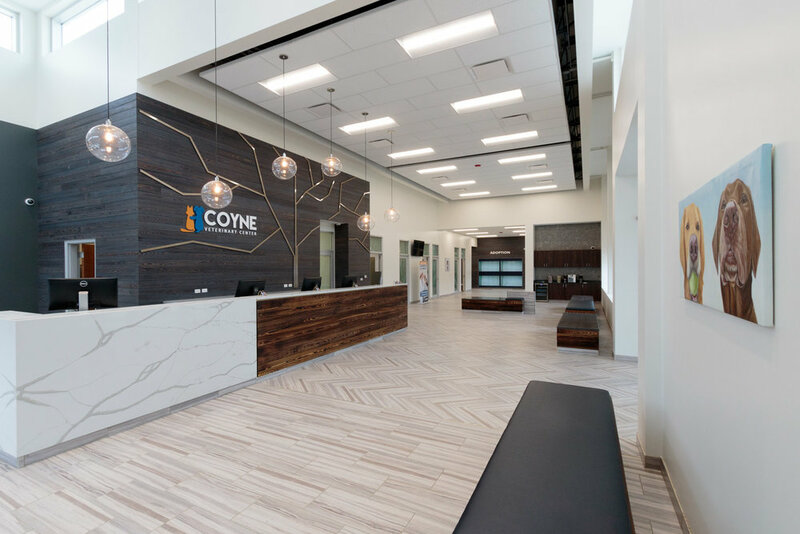 Other clients we've worked with in the world of Animal Care projects include: Countryside Veterinary Center, Skycrest Animal Clinic, City Line Veterinary Center, Finan Animal Hospital, and Downers Grove Animal Clinic.